Apply a theme to give your presentation a professional look. On the View tab, select Slide Show, Editing View, or Reading View to view your presentation. To start on the first slide, select View > From Beginning or Slide Show at the bottom of the screen. To start from where you are, select View > From Current Slide. To stop the presentation, press Esc. Select Notes to show notes. Select Click to add notes and add your notes. Select Notes again to hide the notes. Need the full set of PowerPoint features? In PowerPoint Online, select OPEN IN POWERPOINT. Note: Changes are automatically saved in PowerPoint Online, but in the PowerPoint desktop app, you need to save changes. 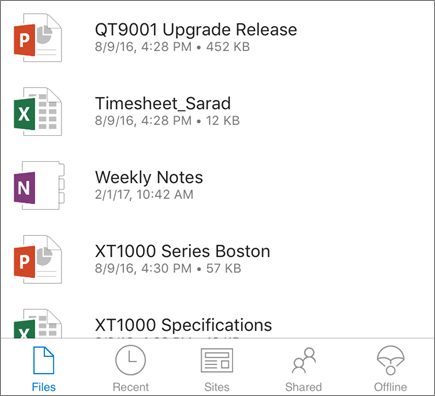 Set up your Office apps on your mobile device so that you can get to your files from anywhere. Or, select Recent and select a recently opened file.